Bread is a baked food that can be prepared from different types of dough. The dough is normally made of flour and water. Bread is baked in hundreds of shapes, sizes, types, and textures. Proportions and types of flour and other ingredients vary, as do methods of preparation. Throughout the history, bread has been one of the most basic foods, as it is also one of the oldest artificial foods. In fact, people were making bread since the dawn of agriculture. People in all cultures serve bread in various forms with any meal of the day. It can be eaten as a part of the meal or as a separate snack. How ﻿D﻿o ﻿Y﻿ou ﻿C﻿ook ﻿B﻿read? What ﻿I﻿s ﻿A﻿ ﻿B﻿read ﻿M﻿achine? How ﻿I﻿s A Bread Machine Made? How Does A ﻿B﻿read ﻿M﻿achine Work? What﻿ Kinds Of Bread Machines Are There? How ﻿T﻿o ﻿U﻿se A Bread Machine? What ﻿E﻿lse ﻿C﻿an ﻿Y﻿ou ﻿D﻿o ﻿W﻿ith ﻿A﻿ ﻿B﻿read Machine? Bake ﻿A﻿ ﻿C﻿asserole? Of ﻿C﻿ourse! How ﻿T﻿o ﻿﻿C﻿﻿lean ﻿A﻿ ﻿B﻿read ﻿M﻿aker? How ﻿T﻿o ﻿M﻿ake Gluten Free Bread? How Do You Cook Bread? Bread is usually prepared from a wheat flour dough, which is made with yeast and allowed to rise. Typically, people bake bread in the oven. However, more and more people turn to the special bread machines to bake fresh bread at home. A bread machine, or bread maker, is a kitchen appliance for baking bread. The device consists of a bread pan or tin with built-in paddles, which is located in the center of a small special multi-purpose oven. How Is A Bread Machine Made? As we mentioned in the previous section, bread maker consists of the several parts. 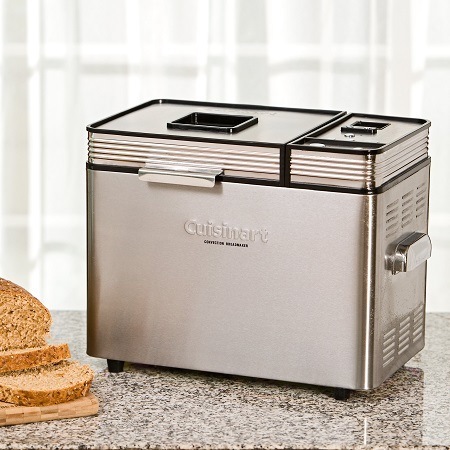 This machine is basically a compact electric oven that holds a single, large bread tin inside. The tin itself is a bit special – it has an axle at the bottom that is connected to an electric motor underneath. How Does A Bread Machine Work? First, you put the kneading paddle inside the tin. When the tin is out of the machine, you can measure the ingredients and load them into the tin. Afterwards, you just need to place the pan inside the oven (machine), choose the program you wish via the electronic panel and close the lid. Here the bread maker magic takes over! One of the first things bread machine will do is kneading the dough – you will hear the sounds. In case your bread maker comes with the viewing window, you can watch the whole process of baking, which is quite fascinating. After the kneading phase, everything will go quiet for some time – the rising phase comes. The machine lets the dough rest and rise. Then, there will be another round of kneading and the phase of proving. Finally, the bread maker’ oven will switch on and you will notice the steam coming up through the steam vent. Even though the usual bread making process is automatic, most machines come with recipe books that provide you with numerous interesting advanced bread recipes. What Kinds Of Bread Machines Are There? Majority of the bread making machines are going to be a little bit different. This is due to the fact that each variation of a bread maker is designed to serve a particular purpose. Below, we will discuss the most common types of bread makers available on the modern market. 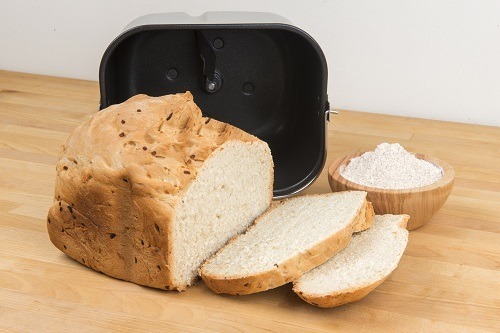 Most of the bread machines bake loaves that are positioned vertically, as the bread tin is shaped in this way. This type of bread machines features only one kneading paddle. There are also some bread makers that have two kneading paddles inside the tin. These bread machines bake horizontal bread, just like the one you get from the bakery of from the shop. 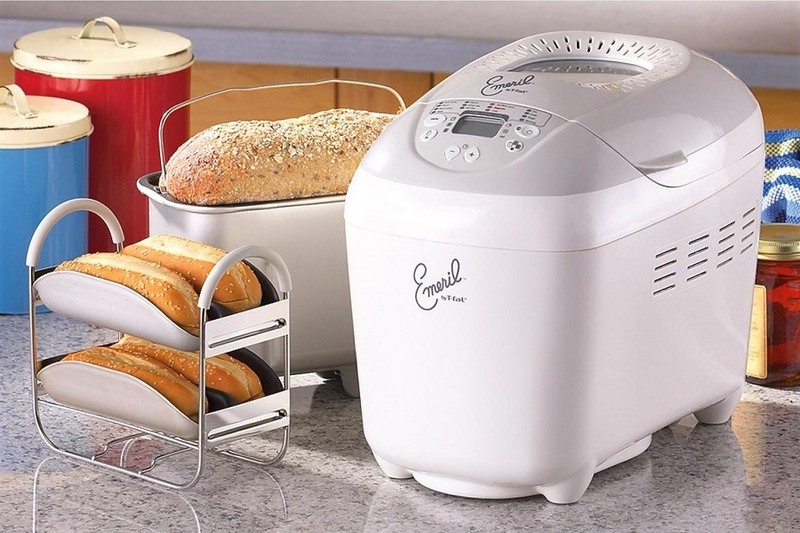 Small bread makers are great for the limited kitchen space or if you don't eat a lot of bread. These little kitchen helpers do not take much of the counter space and produce just enough bread for a couple or one person. Large bread machines come in handy in big families – bread can disappear quite quickly when you have a lot of people at the table. The big bread makers that produce 3 lb loaves of bread are capable of feeding a big family. With the great abundance of the bread maker models on the market, there are definitely those, which are designed to cater the needs of healthy-eating people. Just like that, a bread machine that has a gluten-free setting is ideal for baking this kind of bread. Irrespective of which bread machine you choose, the baking process is pretty much the same everywhere. You load ingredients to the tin, then place the bread pan in the machine and choose the necessary program. Besides the main ingredients, you can add any other extras you want, including raisins, nuts, chocolate chips and the like. Check and follow the instructions/manual. 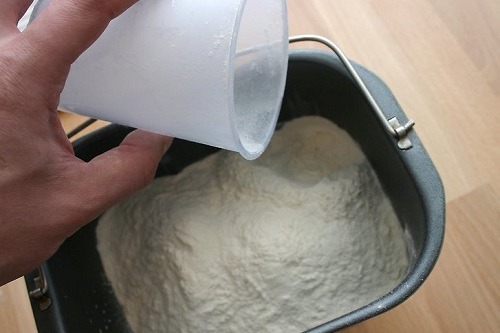 With some bread makers, the dry ingredients should be added first, with others, the wet ingredients go in first. Moreover, when reading bread baking recipes, keep in mind that not all of the bread makers are created equal – some product 1 pound loaves, others make 1,5 and 2 pound loaves. Some of the bread machine models are capable of baking 3-pound loaves. When trying out a new recipe, it is necessary to compare the amounts of ingredients to the recipes typically used in the bread machine. It is very important not to exceed the capacity of the bread machine pan. In case the recipe calls for milk, it is not recommended to use a delayed mix cycle. If you want to make pizza dough in your bread maker, combine the warm water, olive oil, salt, flour and yeast in the bread tin. Set the machine for ‘Pizza Dough’ program following the manual of your bread maker. After your dough is ready, you can transfer it to a lightly floured surface for further processing. While using a bread machine for some might sound like an unnecessary step, other do not imagine the life without freshly home-baked bread. However, let’s turn to the facts – below, we specified benefits of owning a bread machine. First of all, you can enjoy the freshly baked homemade bread. Most bread makers also feature a timer function, which allows you to set the bake cycle at a certain time. This function is very useful when you want to have hot bread in the morning for breakfast. You can control what you eat. By baking bread at home, you can actually control what components are coming into your loaf – this option is very useful for people with allergies or for those, who try to control the intake of some of the ingredients. It is easy. Some people think that baking bread at home is a messy and overall, it is a hard process. However, baking bread with a bread machine is a breeze. You just choose the desired option and relax - all the mixing, rising, and baking process is happening inside of the bread maker, which also makes it a zero mess process! It saves you tons of money in the long term. If you think that buying bread at a store is cheap, you might be mistaken. In turns out that in the long term, baking bread at home will save you money, especially if you have some dietary restrictions. Bread machines are able to produce various kinds of bread: whole wheat bread, gluten-free bread, rye bread and hundreds of other types. They can also make pizza dough, pasta dough, jam, and a number of other delicious dishes. Great taste and quality. You need to accept it – nothing beats the quality and taste of fresh load of bread. Since you are the one who is making bread, you can make sure that you use only the ingredients that are fresh and of a high quality. Home made bread always beats store bought bread in terms of taste and quality. What Else Can You Do With A Bread Machine? We have already mentioned that bread maker uses are not only limited to baking different types of bread. Here, we would like to look into some creative ideas about how to use a bread machine. 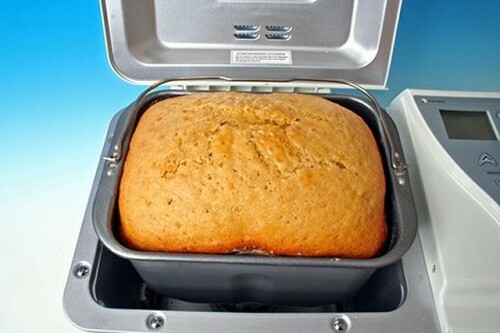 According to the industry expert, Joy Chump, a bread machine is a very versatile kitchen appliance. Mr. Crump is an executive chef at Foode, which is a farm-to-table café in Fredericksburg, Va. 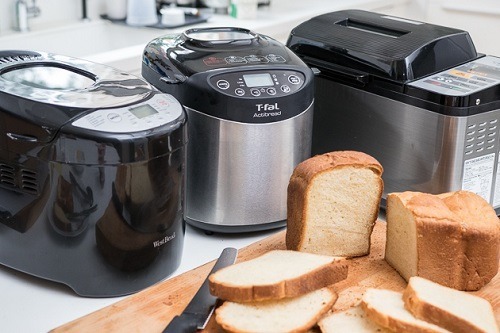 He shared five different ways to turn your bread maker into a multitasker. Mr. Crump says that a bread machine is a great appliance for making apple butter. He highlighted that the slow and steady heat inside the bread machine helps develop the sugars in the fruit. Mr. Crump says that a bread machine is as good as a crock pot. However, he believes that agitation component makes the bread machine perfect for sauce. Bake A Casserole? Of Course! Any casserole you can imagine can be made in a bread maker instead of a conventional oven. Just as with perfect loaves of bread, bread making machines are great for baking cakes. Now, as we have discussed the key moments about bread makers, it is high time to look at the companies that produce them. While there are hundreds of bread machine producers existent globally, we will focus our attention on the most reliable and popular bread machine manufacturers. The Zojirushi Corporation is a Japanese company that produces various home appliances. One of the Zojirushi’s product lines – bread makers. Bread machines from this manufacturer are known for their superior quality. The company producer machines in two sizes that are reflecting the customers’ preferences. The 2 –lb. 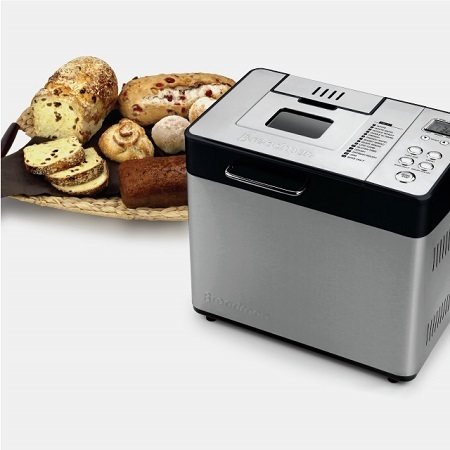 bread machines are perfect for baking traditionally shaped 2-lb. loaf. The 1-lb. bread machine will be a good fit for one person or people who eat less bread. Bread machines from Zojirushi are capable of making high-quality bread, cakes and a number of other dishes. 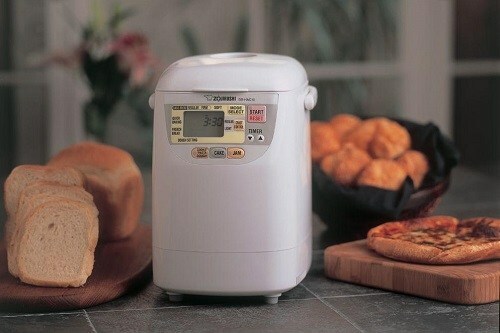 The following cycles are offered by Zojirushi bread makers: whole wheat, cake, jam, homemade (the homemade cycle allows you to program the knead, rise and bake times for your preferences), and dough. We bet you already heard about Panasonic – the iconic brand behind a number of electronic devices. Panasonic Corporation is also previously known as Matsushita Electric Industrial Co., Ltd. The company is a Japanese multinational electronics producer. Panasonic bread makers are at the top of the price basket, yet the price can be explained by a number of amazing features that are offered by these appliances. Panasonic offers five bread makers models, with one of them featuring an automatic yeast dispensing system. The company is an American brand of kitchen appliances. Breadman bread makers offer the opportunity to bake professional style bread at home. The brand is known for its superior quality and reliable customer support. Breville is an Australian small home appliances manufacturer, which was established in Melbourne in 1932. The company is proven to use high-quality materials for their products, and it became quite popular in New Zealand and the US. The West Bend Company was known as a West Bend, Wisconsin company in the period between 1911 and 2001. The West Bend Company has been producing aluminum cookware and electrical appliances. However, it is also known for manufacturing stroke cycle engines, such as outboard boat motors. With the great experience behind its back, West Bend Company is capable of delivering the high-end product to the customers. The Small Kitchen Appliance Division of the West Bend is known as West Bend Housewares. How To Clean A Bread Maker? If you want to prolong the life of your bread machine, it is necessary to take care of the appliance on a regular basis. In order to keep your bread maker in the perfect condition, you won’t need to spend much time. After you have unplugged the bread machine and it has completely cooled down, you can start the cleaning process. 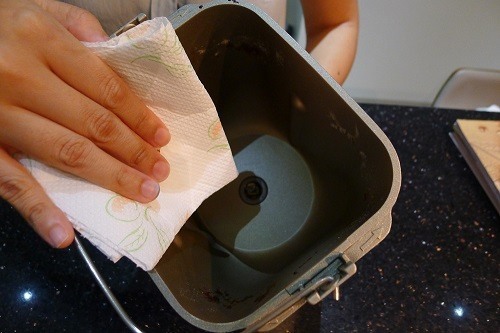 Turn it on the side over the sink, garbage or any other surface and gently sweep the crumbs or remaining flour with some sponge or soft brush. If there is some dough stuck to the walls of the bread maker tin, leave it till it dries out – and then remove in the same way as you did with the crumbs. The same process should be followed if there is some dough on the heating element of the bread maker. The next step in the bread machine cleaning process is to clean the baking tin and the kneading paddles. For this purpose, you can use warm water, soap, and soft sponge or cloth. 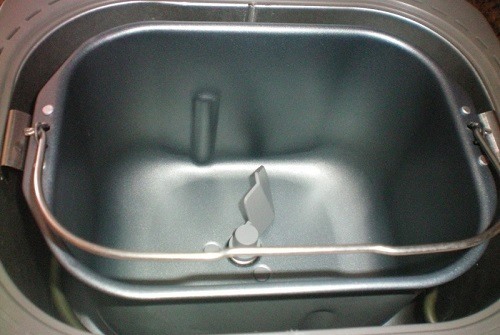 It is recommended to avoid using chemicals while cleaning the pan. Bear in mind that not all of the removable parts of your bread maker is dishwasher safe. There are many bread machines that have parts that can be washed in the dishwashing machine. However, it is always better to double check and read the manual in order to find out the compatibility part. After you finished washing the parts of your bread machine, make sure that all of them are completely dry before putting them back together. That’s all! It is that simple – three easy steps to keeping your bread machine always in great condition. As a bonus, we have prepared some more tips about cleaning and maintenance of bread makers. 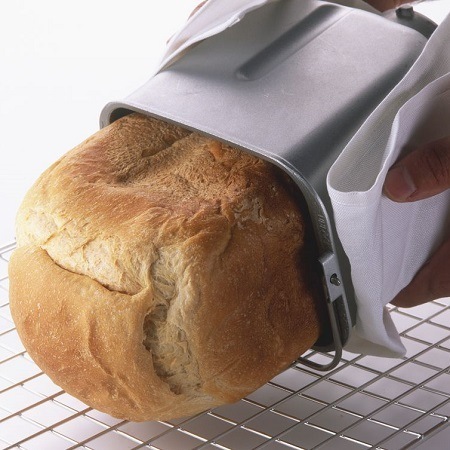 If any liquid touched the inner surface of the bread machine, use a microfiber cloth to soak up the moisture. Make sure to repeat the same process until there will be no moist left on the heating element. It is important to take good care of the heating element of your bread machine, as this is one of the most fundamental parts of the appliance. Keep the heating element clean and do not let any dirt/crumbs come onto it – this poses a risk of fire. In order to clean the heating element, use a soft cloth and remove the dirt very gently. Place the water into the bread tin. Sprinkle the sugar and the yeast over the water. Leave the mixture for 10 minutes. Add in the melted butter, oil, flour, and salt. Choose the Basic or White Bread setting on your bread machine and press start. Bake for 3 - 4 hours. 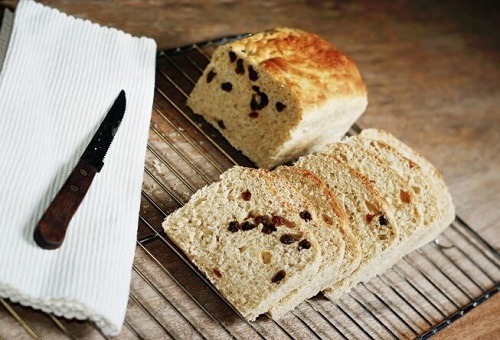 How To Make Gluten Free Bread? You can mix most of the ingredients in the baking pan of the bread maker as suggested by your manual. Use the white bread setting at medium crust (if you have these settings). Bake for 3 - 4 hours. Feeling hungry? I know – reading so much about bread makers might be quite challenging. If you are ready to take your bread machine journey to the next level, read our Best Bread Machine Buying Guide. There, we discuss the specifics of choosing the best bread maker and review the most popular and reliable bread machine models available on the modern market.